Guys, I have a confession to make. I've been slacking hard on the blog front. It's as though the fact that it's FINALLY nice weather has made me unable to respond to emails rapidly, spend less time on my laptop (and phone!) and go outdoors! And it feels SO GOOD. I've still been working on/shooting a bunch of recipes, but I'm finding that it's more difficult to take a moment to actually sit down and look at the photos I'm taking. But hey, that's what summers are for, right? This week is full of events. It's Molly's birthday, Pat's birthday, AND Father's Day, all in one weekend. I can't wait to celebrate everyone with a big double-family day in the city on Saturday. I'm also working on a "Summer Bucket List" which is something I try to do every year. Pat and I have yet to fully complete one so the goals for this year will be more feasible! I'm excited to share it on the blog next week. I hope everyone is enjoying the beautiful weather! I use this time of year as a reminder to myself to get outside and take advantage of the beauty everywhere, even if it sometimes comes before stuff you need to do for work - happiness is important too! In a mixing bowl, combine flour, salt and butter and mix with a pastry blender until butter is pea sized. In a small bowl, mix water and apple cider vinegar and add to the flour mixture, a tablespoon at a time until it just starts coming together (you may not need all 6 tablespoons of the water.) Shape into a disc, wrap in wax paper and refrigerate for 30 minutes. In a small saucepan, bring all of the ingredients to a boil until it begins to thicken (about five minutes). Using a fine mesh sieve, strain out the liquid so the chai leaves are removed, into a glass container. Let cool to room temperature. Preheat the oven to 375 degrees F. To make filling, mix all the ingredients together, adding the chai syrup in last, in a medium mixing bowl and set aside. To assemble the galette, remove dough from refrigerator and using flour, roll out until it is about 1/4 inch thick and circular. The circle doesn't need to be perfect. Transfer dough onto a parchment lined baking sheet. 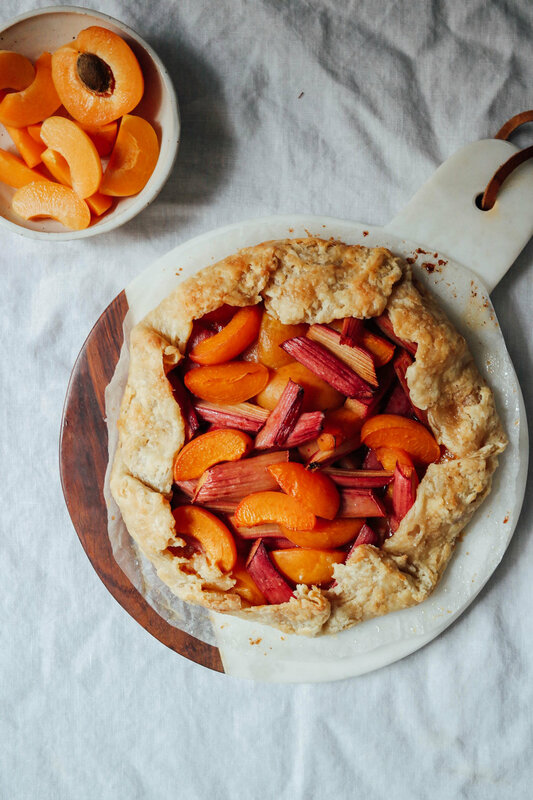 Carefully dump the apricot and rhubarb filling into the center of the dough and shape as desired. Gently fold the edges of the galette around the filling so that they slightly overlap. Using a pastry brush, dust the edges with milk and then extra turbinado sugar. Bake about 30 minutes, until the crust is golden brown and the fruit filling is bubbling. Serve warm.